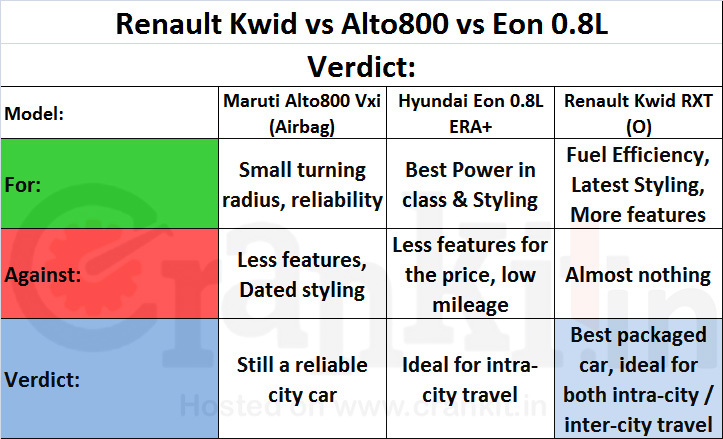 Renault Kwid vs Alto 800 vs Eon: Can Kwid win the biggest battle of 800cc? Is Renault’s latest kid (Kwid) strong enough to challenge the market leader? The battle lines have been re-drawn: Renault Kwid vs Alto 800 vs Eon. The Renault’s new kid (Kwid) is the latest entrant into the 800cc fight-club. Does Renault Kwid have it to take on India’s largest selling car by volume Alto 800? We have compared the three cars on 43 points – Renault Kwid vs Maruti Alto 800 vs Hyundai Eon to find out if this Renault kid (Kwid) has it in him...! All the three cars have a naturally aspirated 3-cylinder MPFi engine; which is BS-IV complaint. Kwid’s 799cc engine produces a decent 54 Ps power & 72 Nm torque, just marginally low than Hyundai Eon which makes 56 Ps and 76 Nm respectively. It is bit higher than the Maruti Alto 800 which makes only 48 Ps & 69 Nm. However, with best-in-class ARAI mileage of 25.17 Km/L; Renault Kwid would cover far more distance than both Maruti Alto 800 (22.74 Km/L) and Eon (21.10 Km/L) with same amount of fuel. All the three cars provide a 5 speed manual transmission. So, overall, Renault Kwid gives better performance over the two. Renault Kwid is bigger in the size than Alto 800 & Eon. Kwid’s length and width are higher than both the Alto 800 & Eon. Renault Kwid has a wheelbase of 2422 mm - the most among all, making it spacious internally. At 1478 mm the height of Kwid is also low; just as Alto 800’s 1475 mm and hence, Kwid will get an advantage while handling. Renault Kwid also has highest ground clearance of 180 mm, making it perfect for the Indian road conditions. Renault Kwid has about 300 litres boot space to carry luggage. 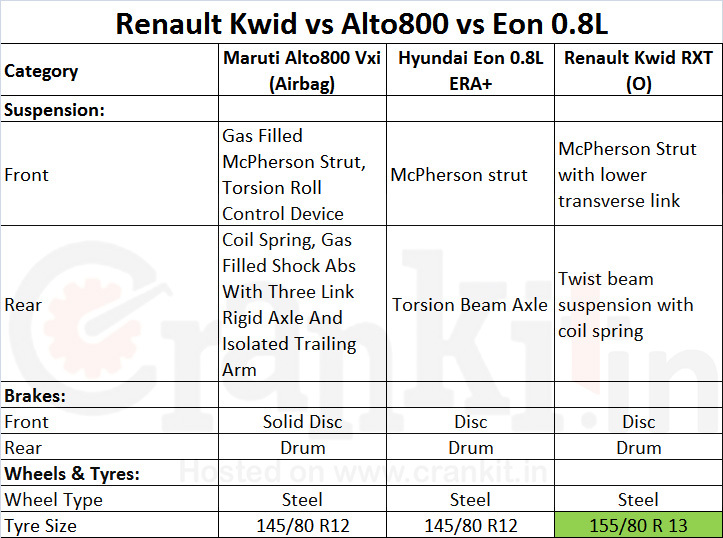 Both Renault Kwid & Eon provide electric power steering (EPS); while Alto 800 has a normal power steering. However, with the lowest turning radius of 4.6 meters the Alto 800 will be able to turn easily in congested city areas. Neither the Kwid nor Eon has specified this data. The front suspension of all the three cars includes McPherson Struts. In addition, the Alto 800 provides torsion roll control device, whereas the Kwid provides lower transverse link; both for stability. The rear suspension for the Renault Kwid has a Twist-Beam design with coil spring which is similar to Eon. All the three cars provide discs brakes at front and drum brakes at rear and also the steel wheels. Renault Kwid provides tyre size of 155/80 R13, a 13” radial that is bigger than Alto 800 (12”) & Eon; which is an advantage on Indian roads. Among the three, Renault Kwid provides more features in the same price range of Rs. 3.50 lakh; such as Driver Airbag, Immobiliser, Keyless entry, Central Locking, Digital dashboard, Single DIN audio with touch-screen & navigation. In addition, the Renault Kwid also provides front fog lamps, which are beneficial during low visibility. Renault Kwid’s fuel tank of 28 litres is smaller as compared to Alto 800; which has 35 litres. 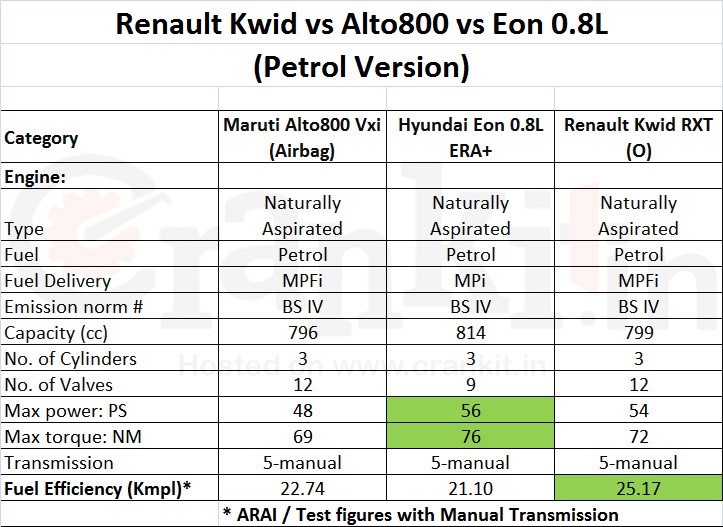 However, Renault Kwid’s ARAI certified fuel average is 25.17 Km/L, the highest as compared to Alto 800 & Eon; which makes it a clear winner in this category. 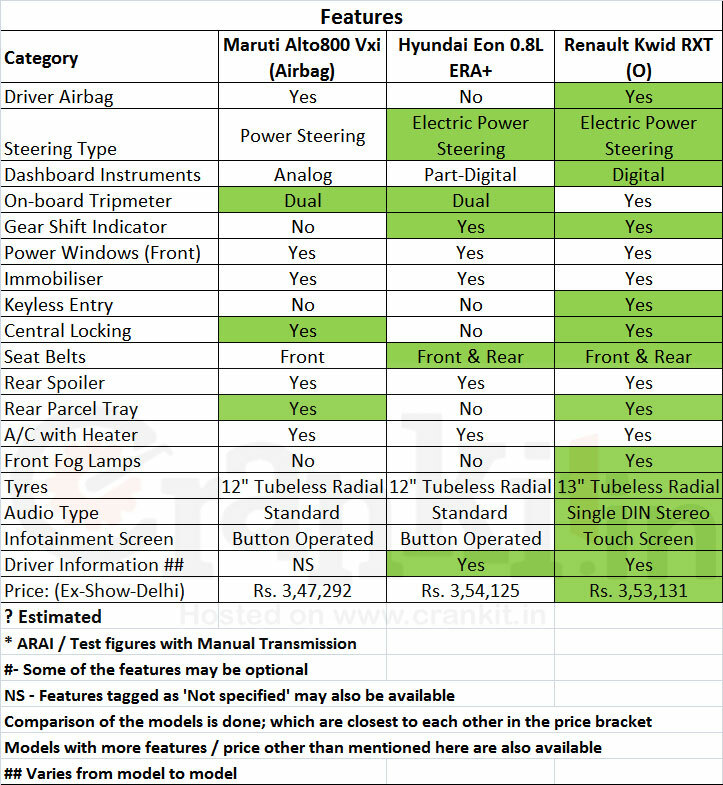 The top end RXT (O) variant of the Renault Kwid compared here is priced at Rs. 353,131/-; which is just a bit lower than mid-range Hyundai Eon ERA+ at Rs. 3,54,125/-. The top end Maruti Alto 800 VXi (Airbag) has the marginally lower price at Rs. 3,47,292/- (All Ex-Showroom Delhi). Renault has really loaded its latest kid (Kwid) with all the weaponry to fight the toughest battle in the Indian car industry. The smart Renault Kwid provides decent power for engine, highest mileage, better driveability, trendy design & class-leading features. Renault Kwid ticks almost all the boxes, which can give the Alto 800 & Hyundai Eon a run for their money. With so much value for money, the Renault Kwid is the best packaged car in the entry level hatchbacks segment for aspiring Indians. There remains no doubt that this smart Renault kid (Kwid) has everything to take this battle to the kingdom of the market leader Alto 800 and even challenge it.